What a colorful batch of Serendipity parrots I have for you this month! I ended up with a lot of scrap clay recently, and while I had absolutely NO intention of making so many "scrap clay pendants", they simply decided they had to be made I guess! 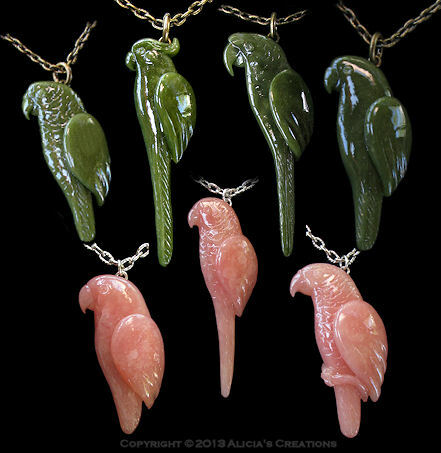 So here are 13 incredibly unique parrot pendants, in beautiful spring colors, with bits of silver leafing adding some sparkle! The Serendipity pendants for sale this month could represent a wide variety of species, it is really up to your imagination - however I did base some of the shapes on: African Greys, Macaw, Cockatoos, Conure, Budgie, Parrotlet, Eclectus, Quaker, Amazon, Cockatiel, and more. See if you can pick your favorite species out! The necklaces are all being auctioned on eBay for five days, ending on Wednesday, May 1st. However, I have offered a Buy It Now option on each of these pieces, so if you can't wait for the auctions to end, you are welcome to go snap one up before the bids start! New Flights of Fancy and More on eBay! I really LOVE making jewelry in my Flights of Fancy style! This particular bird could represent a Quaker, Conure, or some other species - what do YOU see? The pendant is so striking in black and shimmering green, with silver and gold highlights that are picked up in the glass beads. The set is really stunning in person! There are also three other unique creations new on eBay, with a totally different look! I sculpted a little budgie pendant in a "Kawaii style", what do you think? Also up for auction is a bright yellow Cockatiel face bracelet charm, as well as another one of my "scrap clay birds"! This one has yellow, black, and various other colors striping around. All of the jewelry is being auctioned on eBay for the next 5 days, ending on Monday. New Flights of Fancy Birds Have Flown In! In a break from my typical parrots, I created some "Flights of Fancy" birds this month! They are more whimsical, and created in a different way, using metallic pigments on top of stamped and textured surfaces on the pendants. A silver glass leaf bead adorns each pendant, and the bird's eyes are black agate. I think of these pendants as wearable mixed media collage! 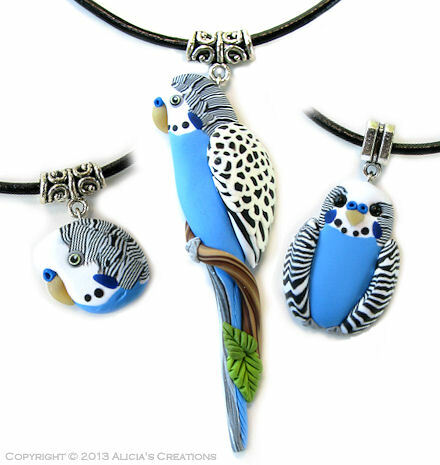 These particular birds loosely represent: African Grey, Moluccan Cockatoo, Conure, Cockatiel and Hyacinth Macaw. Beautiful glass beads in color schemes of pink, navy blue, and hints of yellow make up all of the necklaces, except for the Moluccan, which is beaded in pink and yellow. These five unique beaded necklace/earring sets are being auctioned on eBay for the next 5 days, however these Flights of Fancy necklaces DO have the Buy it Now option for immediate purchase. BIRD OF THE MONTH: Lories & Lorikeets & more! It's been quite a few years since I have made any Lory or Lorikeet species, and I was needing some new photos for my website, so I picked the Rainbow/Green Naped Lorikeet as the Bird of the Month! In addition, I created a few other Lories that I've never made before! It is incredible how very many lorikeet species and subspecies there are, all of which are so beautiful, I had a hard time picking just a few! The jewelry on auction for the next THREE DAYS include the following: Rainbow bracelet charm, Rainbow choker necklace, Rainbow glass beaded bracelet, Rainbow pendant, and a Rainbow glass beaded necklace/earring set! 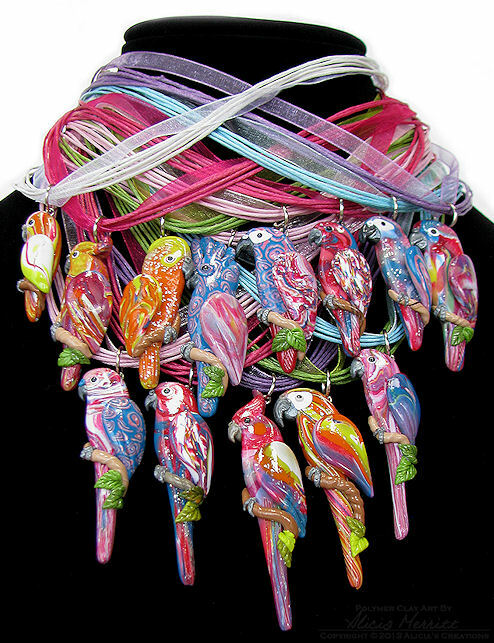 There is also a Scaly-breasted Lorikeet glass beaded necklace/earring set, and a pair of Chattering Lory charm dangle earrings! Besides the Lorikeets, there are also some other new pieces, including the Green and Yellow Christmas Budgie shown below, a blue Budgie not shown, and several new humorous "bird poop" items! I am offering a Buy It Now option this time for those of you wanting to purchase items quickly for gift giving! Please note however, that once an item receives a bid, the Buy It Now option disappears. (So, to make an instant purchase without waiting for the auction to end, you must snap up the item before it has bids.) Go to my eBay Store to see all of the creations available! Don't forget, there is a sale on my inventory of eBay Store items until Christmas! There is still time to snap up some unique gifts for your bird loving friends!